Investigative journalism and what it means to rake muck. The best investigative journalism troubles the powerful—and In These Times has been busy making trouble for 40 years now. Investigative journalists have since worn the badge of “muckrakers” proudly, and at In These Times, it’s a label that suits us just fine. The journalists who have worked here understand that it’s in the muck that the truth is often buried. ITT has always been willing to dig into stories that the mainstream media ignored—perhaps due to ideological blinders, or corporate pressure, that keep them from looking “downward” at how the actions of governments and corporations impact marginalized communities. By continually raising this question, In These Times arrived first to the scene of some of the most controversial and contested stories of the past four decades—and caused no end of trouble for people in high places. It was during the Reagan administration that In These Times’ investigative reporting came into its own. ITT dogged Reagan throughout the 1980s. At the height of the Iran-Contra affair, the paper had reporters in more than half a dozen countries chasing leads. Over a four-year period, it published dozens of articles connecting the threads of various programs through which the Reagan administration, circumventing Congress, channeled funds to paramilitary groups attempting to overthrow the elected government of Nicaragua. That included Vince Bielski and Dennis Bernstein’s December 1986 story, which pieced together the outlines of what became a major scandal for the Reagan administration: that the Contras were involved in trafficking cocaine into the United States. Investigative reporting at ITT reached the next level under Sheryl Larson, who joined the staff in 1982. 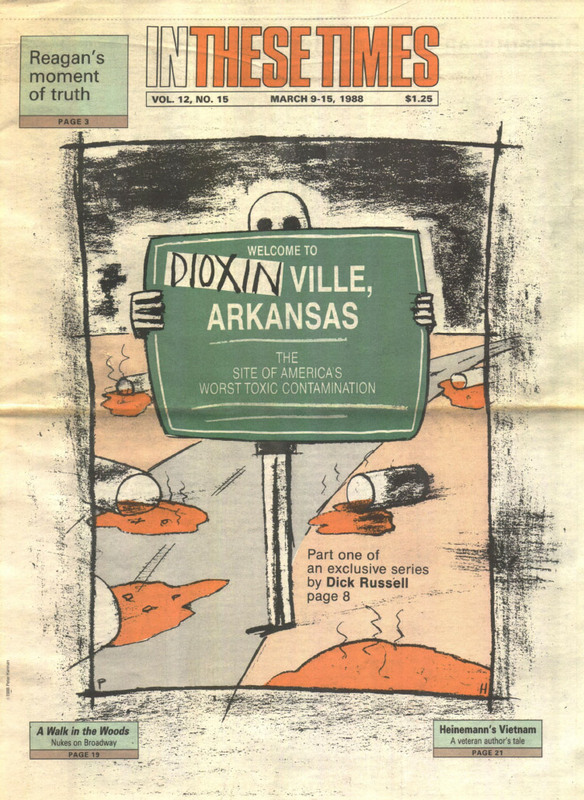 Larson was managing editor for 12 years, and under her guidance reporters broke dozens of stories, including a three-part series on the chemical contamination of a small Arkansas community—at the time, the worst hazardous waste incident in the history of the United States. The residents of three neighborhoods that bordered a former chemical plant in Jacksonville, Ark., had been exposed to dioxin, one of the most lethal substances ever produced. In These Times revealed how the EPA botched the clean-up and how chemical companies attempted to dodge responsibility after years of dumping toxic waste at the site. Over the years, ITT has waded into the muck time and again to investigate environmental devastation and workplace abuses—issues that other outlets often regard as undeserving of journalistic rigor. In a February 2013 cover story, Spencer Woodman documented the effects of a decade of cuts to the state agencies that enforce minimum wage and overtime laws, which left employers in many states essentially free to underpay their workers without consequences. Woodman told the story of Anthony Van Buren, a 59-year-old contractor who sought help from Virginia’s Department of Labor and Industry in recovering $1,000 he said his employer had never paid him for a painting job. Instead, the department told Van Buren that it was unable to take new cases, and he would have to prosecute his employer himself. The investigation helped draw attention to a national epidemic of wage theft. Soon after, Virginia restored funding for wage-and-hour investigators. In January 2014, In These Times entered a new era when it partnered with Chicago attorney Leonard C. Goodman to create the Goodman Institute for Investigative Reporting. Through the institute, ITT has expanded its investigative operation, providing journalists with the resources to pursue under-reported stories, and freedom from the influence of advertisers, corporate entities and governmental pressure. The first Goodman story, an investigation by Stephanie Woodard into how Native Americans are systematically disenfranchised, won a “Best Feature” award from the Native American Journalists Association. In March 2015, the Department of Justice took the rare step of drafting legislation that would help reduce barriers facing Native voters. 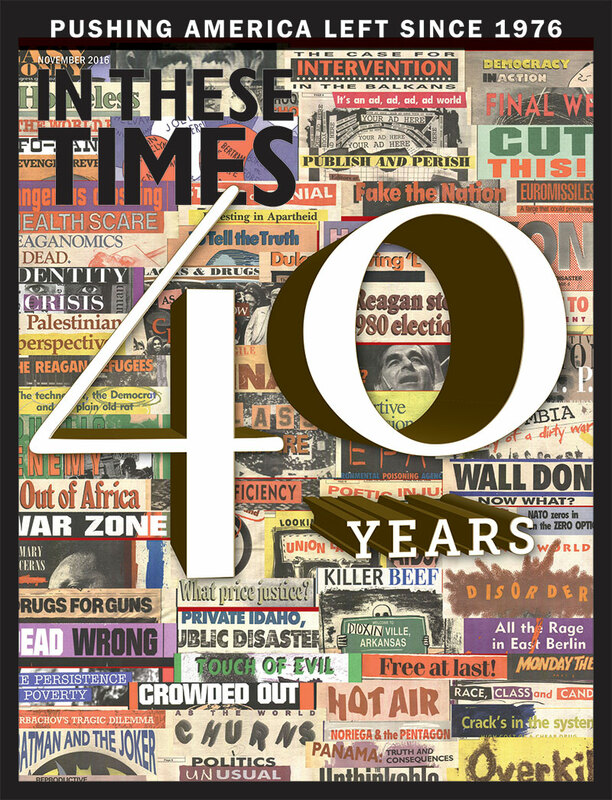 Since then, In These Times has published investigative pieces on the U.S. role in the Central American migrant crisis, the revolving door between the government and the chemical industry, police surveillance of activists, inhumane treatment of pregnant mothers in prison, the devastating effects of the lack of paid family leave and more. Since January 2014, much of In These Times' investigative reporting has been funded by the Goodman Institute for Investigative Reporting. Sometimes the truth is hiding in plain sight. In September, Seth Kershner revealed that the Obama administration’s so-called freeze of military equipment transfers to police forces was anything but, simply by calling the right official and asking how much gear was still making its way into the hands of local law enforcement. But often it takes much more digging. Earlier this year, Stephanie Woodard spent months earning the trust of the families of Native Americans who have been killed by police. Her investigation shed light on a wave of police killings that few in the media have bothered to report. That kind of story takes time and money—two things in shorter and shorter supply in today’s media environment. And then there’s the risk. Increasingly, the real threat is not just governments, but corporations and wealthy individuals who can use money and lawsuits not just to intimidate publications, but to snuff them out. It’s a crisis in journalism that has implications far beyond the industry. To some, a publication that began as a socialist newspaper and has never tried to hide its political viewpoint may seem like an unlikely home for investigative reporting. But in truth, all investigative journalism has an agenda. Mary Heaton Vorse, a novelist who took up labor journalism after participating in a 1912 textile strike, explained her objective plainly: “I wanted to see wages go up and babies’ death rate go down.” In These Times has remained committed to its founding belief that a crusading press, working alongside an informed public, can create change—but only if it’s willing to look honestly, and unsparingly, at the root cause of problems. Maybe they were just afraid to make trouble. In These Times encourages journalists to submit investigative story proposals to the Leonard C. Goodman Institute for Investigative Reporting. To learn more and to submit a proposal, visit inthesetimes.com/investigative. Christopher Hass is the In These Times deputy publisher.